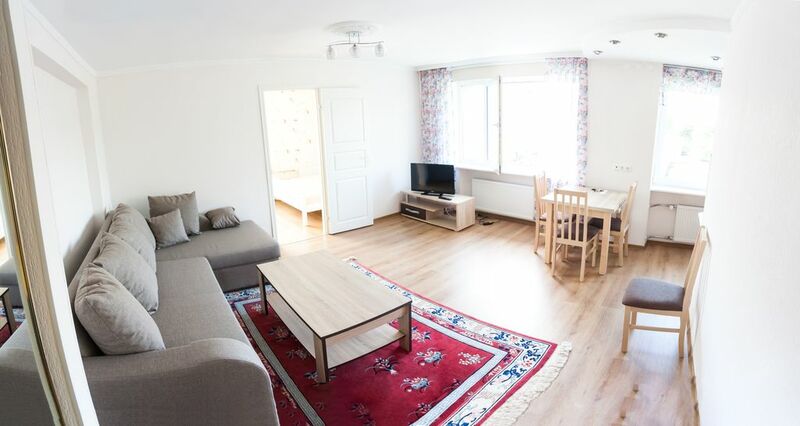 The apartment is located on a quiet street in the city centre and just a short 10-15 minutes walking distance away from the ancient Old Town of Tallinn. The apartment is on the 4th floor of 5-floor residential building. There is no elevator in the building. Cosy and quiet 42m2 2-room apartment that sleeps up to 3 people (2+1). In the apartment there are a living room with small open kitchen, bedroom and a toilette with a shower and a bath. The apartment is fully furnished. The kitchen is equipped with dishes, kettle, coffee machine, toaster, and a fridge with freezer. In the living-room there is a sofa with a built-in bed (for 1 person), TV and free WiFi. Bedroom is equipped with a double bed that sleeps 2 people, wardrobe, iron and an ironing board. Toilette is equipped with washing machine and a hairdryer. Towels and bed linens are provided. Smoking NOT ALLOWED in the apartment. Pets NOT ALLOWED in the apartment. Events and parties are NOT ALLOWED. Shower, bath, toilette, washing machine, hair dryer. No free parking area nearby. You can park on the street or a cheap car park nearby (address: Imanta 8). Free WiFi in the apartment. Network name and password will be provided at check-in. The living room is equipped with comfortable sofa, table and TV. The kitchen is equipped with dishes, kettle, coffee machine, toaster, and a fridge with freezer. No elevator in the building. Apartemnt is on the 4th floor. Check-in and check-out with owner. Super tranquilo y muy cerca de todo. Genial. An sich liegt die Ferienwohnung relativ günstig zum Altstadt und anderen Sehenswürdigkeiten. Die Altstadt und Park Kadriorg liegen z.B. in 20 min. Zu-Fuss-Entfernung. Mit öffentlichen Transportmitteln sind die genannten Ziele allerdings direkt nicht zu erreichen. Die Wohnung an sich ist für 2 Personen nicht besonders groß, aber ziemlich ausreichend. Die Einkaufsmöglichkeiten sind in der Nähe (Bauernmarkt und Supermarket). Die Wohnung an sich ist sauber und zweckmäßig eingerichtet. Bis zum Flughafen sind nur wenige Minuten mit Bus zu fahren (Linie 2), Bushaltestelle an der nächstliegender Straße. * The apartment is located in the city centre of Tallinn. * The old town is only 10-15 minutes walking distance away. * Several large shopping centres nearby (few minutes walking distance). * Market in a few minutes walking distance.